The city of Boston has used up about $10 million of its $18.5 million budget for snow removal. As another snowstorm took aim at the New England region on Tuesday, transportation and public works officials around the state said this winter’s high levels of icy precipitation have begun to threaten their balanced budgets. At the Massachusetts Department of Transportation, snow-related expenses have already come in at $61 million — $18 million over the budgeted amount. Boston has used up a more modest portion of the plow-related allotments in its coffers: $10 million of its $18.5 million budgeted has been spent. 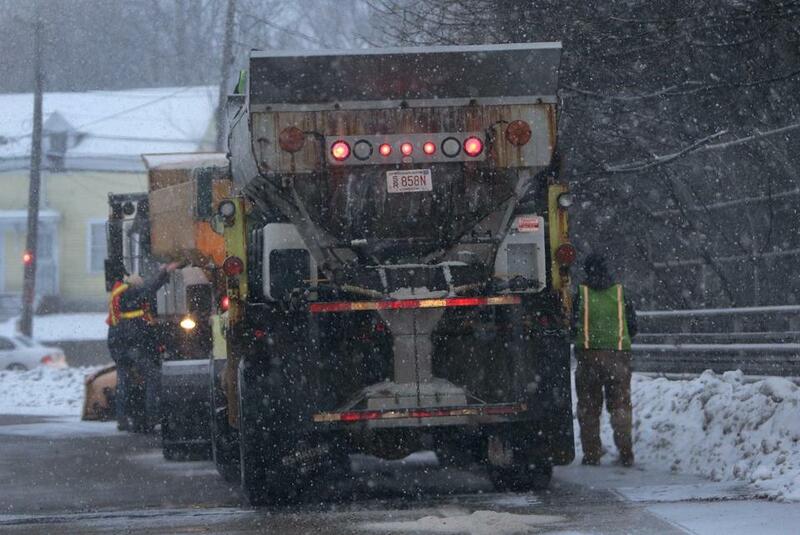 In other cities and towns around the state, public works departments are inching closer to tapping out on their snow-removal budget, causing local leaders to cross their fingers that the wintry weather will abate soon before their remaining funds dwindle to zero. For now, there seems to be no sign of a slowdown: Wednesday’s storm was expected to drop 6 to 10 inches on the Boston area, starting as early as 4 a.m. and wasting no time before delivering a powerful wallop. School in Boston has been canceled for Wednesday. Heavy snow, Cadima said, means a difficult morning commute. The Department of Transportation’s 4,000 plows were scheduled to start hitting the road at about 1 a.m. Wednesday. Wednesday’s storm is the latest in a steady stream of snowfalls this winter. Even the snowstorms that did not pan out — like the much-dreaded Jan. 22 storm that dropped a mere four inches — have caused work crews to overspend on road treatments. And, because plows were able to clear roads quickly, some towns made last-minute reversals on their decision to cancel school, sparking a different kind of ire. “There were many schoolchildren upset with me,” Highway Administrator Frank DePaola said at a Department of Transportation meeting last month. To close this year’s snow budget gap, Transportation Secretary Richard A. Davey will seek supplemental funding from the Legislature. But other towns do not have that option. Freetown is already over its estimates — the town has spent 1.4 times its $100,000 budget. Freetown’s highway surveyor, Charles J. Macomber, said he feared the town would have to pay three times the amount it had expected in the budget. Harvard is near empty: 92 percent of $202,867 budget has gone the way of the melted snow. But Maureen Lemieux, Newton’s chief financial officer, said the city has only reached the halfway point in its snow removal budget. She estimated that the city had spent at most $2.7 million of its $5.3 million snow removal allocations. Provincetown also appeared to be sitting pretty: The town has spent 41 percent of its snow budget, said Sherry Prada, the operations director at the city’s Department of Public Works. But, Prada said, they are not breathing sighs of relief yet. The town has not yet been billed for a recent order: 180 tons of salt. Martine Powers can be reached at martine.powers@globe.com. Follow her on Twitter @martinepowers.